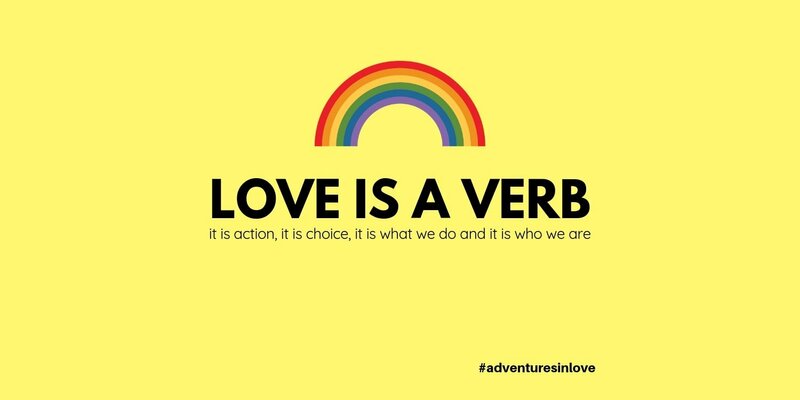 We choose love, because unlike attractions, love is a choice. For gays and lesbians, the word “choice” can mean a couple of things. Let me clarify that in this context; I am not referring to the concept that you have a choice as to whom you are attracted, rather you have a choice as to how you nurture that attraction once it presents itself. A commitment is a choice. The choice does not stop with the commitment. The commitment is the foundation for all of the choices that you continue to make each day. 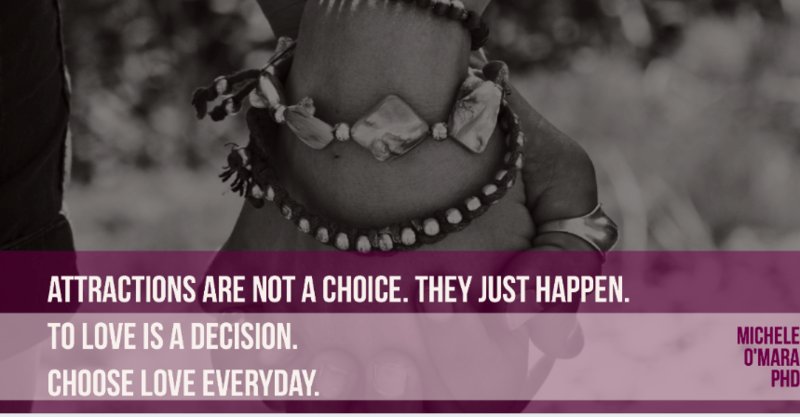 Everyday you have a choice about love, and a choice as to how you communicate your love for your partner. To love is a decision, a choice; just as you can choose love, you can also choose to not love. 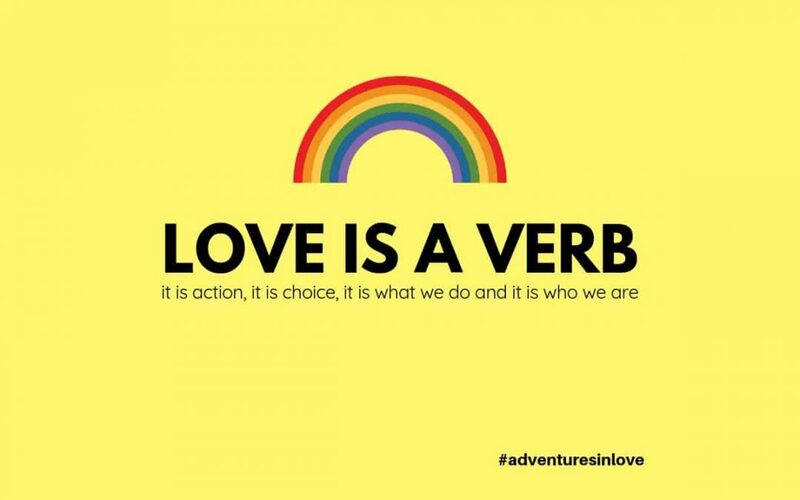 Love is a verb. Remember this, when, in the midst of your long-term relationship, you unexpectedly find the new girl at work quite attractive, and she is flirting with you everyday. When you entertain thoughts of starting fresh, and flirting back, know that these are choices you make. An affair is not an accident. Infidelity is a choice. The decisions you make to be faithful are rooted in the same ability you have to make the decision to be unfaithful. Choose the behaviors that support the person you want to be, and the relationship you want to have. Choose love. I think when Sara Bareilles says, “I choose you,” she is choosing love. If only I could write blogs that sound like this…. The degree to which we feel love is determined by the degree to which we behave in loving ways. Love is actually much more than just a feeling. Love is the outcome of actually doing something loving. In order to express love, we must first possess love. We’ve all heard the old saying, “You must love yourself before you can love another.” This makes sense if you consider that in order to give anything, we must have it to give. Loving someone is a choice. Who we find attractive is not — what happens with or without our consent! I think most of us have been attracted to someone at some point about whom in retrospect we wonder, “What was I thinking! ?” What we do with our attractions is up to us. The attraction is not the issue — it’s how we respond to it. This is an important concept for folks who are tempted to have affairs. Developing an attraction is not the actual “problem” — it is the choices you make around that attraction, but that’s another newsletter! When Barbara arrived she greeted Amy with a hug and apologized for being late. Barbara smiled at Amy with a hopeful look, and as we walked back to my office I heard Amy whisper to Barbara, “You look beautiful today.” Genuinely surprised, (as was I!) Barbara responded simply with, “I love you.” Though this is just the beginning, I smiled a quiet smile. For at that moment, Love was in the Air — and when we string enough of those moments together, we can get love back in our lives and in our hearts. My parting thought is this: Love is not something that we have, it’s something that we are. Be love! ❤️ Michele O’Mara, LCSW, Ph.D. is an expert lesbian relationship coach (www.lesbiancouples.co) with a comfortable obsession with all things related to love and relationships between women. She is particularly fascinated by lesbian couples in blended families, issues of infidelity, lesbian sexuality, and recovery from lesbian breakups. She is the author of Just Ask: 1,000 Questions to Grow Your Relationship, which is available in paperback or Kindle on Amazon, as well as an app on Itunes /Google play. Lastly, she and her wife Kristen host Lesbian Couples Retreats in various destinations and you can learn more about those here.